It's pretty important that the brakes function flawlessly. You could fit the best brake rotors and brake calipers in the world at the wheels, but they won't do you any good if the main brake cylinder doesn't do its job properly. All the power to stop your car is generated in this little cylinder that's mounted against the firewall in the enginebay. When you hit the brakes, and move the pedal, you move a little plunger inside the cylinder. This pushes against the hydraulic fluid that's present in the braking system. 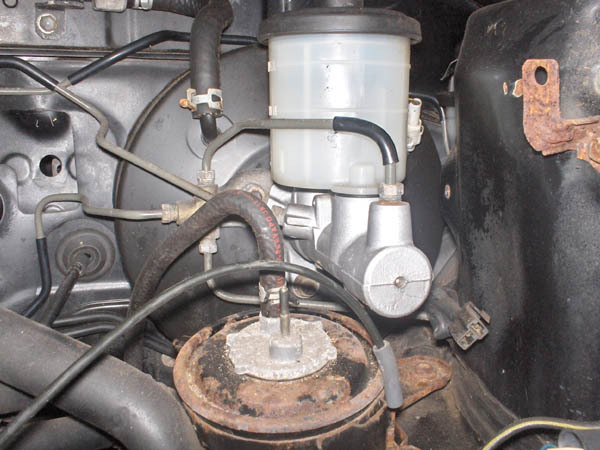 This displaces the fluid and that same displacement is then transferred to all the brake calipers which pushes the brake plungers out against the brake pads, which are forced against the brake discs. This causes friction and that stops the car. I only drove the car a few meters, but the brakes were working just fine when I drove it. But the main brake cylinder was already more than 20 years old and the rubbers of the plungers can wear or even deteriorate with age. There are refurbishing kits available for this cylinder, which contains all the soft parts to be replaced. So it made sense to me to just refurbish the main brake cylinder as well and clean it up a little to make it look better too. 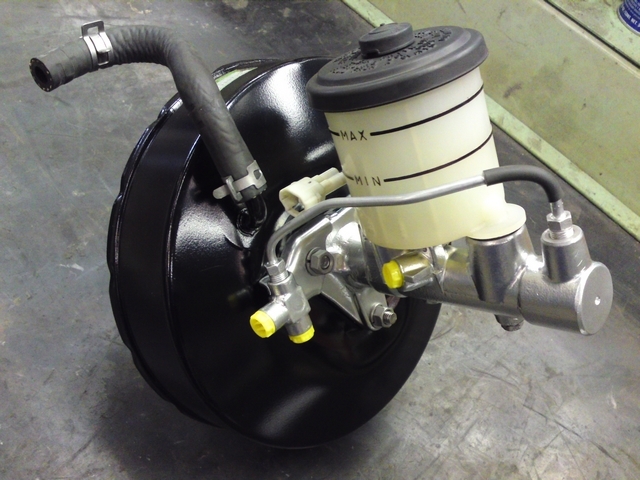 The main brake cylinder and brake booster still mounted in the car. 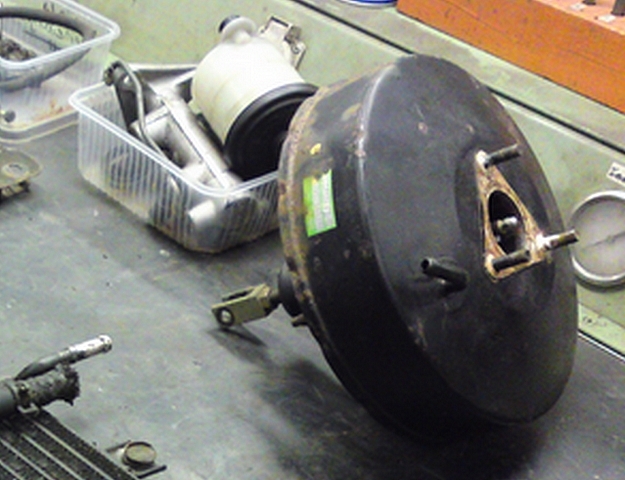 The brake booster, with the main brake cylinder already separated. I had to take the whole thing apart first, to be able to clean, sandblast and paint all the parts. The reservoir that contains the braking fluid has also been rigorously cleaned . As is the case with many of these reservoirs, they become very dirty and dirt just cakes to the inside of them. But they clean out really well with the right materials and I got it looking like new. With some black paint, I accentuated the level indications and text that was on the outside so they were easier to read. Before I sandblasted the cylinder and its parts, I made sure I taped off the bits where I didn't want any blasting medium to enter (like the inside of the cylinder walls). 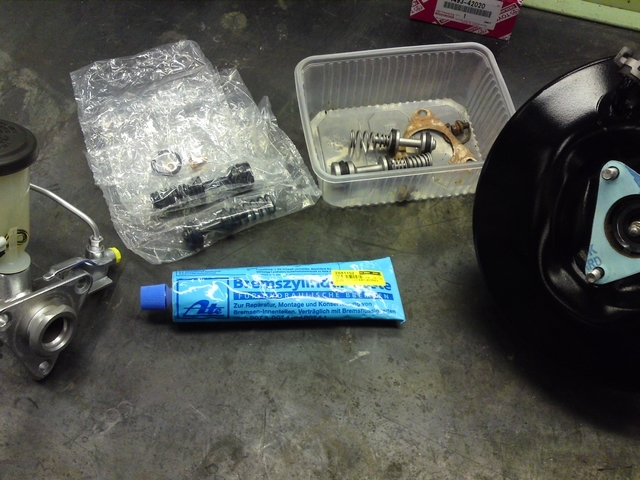 I then sandblasted all the parts and gave them a nice coat of protecting paint directly after to prevent corrosion. The cylinder is made out of aluminum, so it can't really rust. But even aluminum can corrode which doesn't look really nice. When that was all cleaned up and ready, I could start putting everything back together with the parts from the refurbishing kit. It's also important to use the right grease when putting any part of the braking system back together. Ordinary grease will be eaten away by the aggressive braking fluid and will contaminate it or the wrong grease might even damage the rubbers etc.